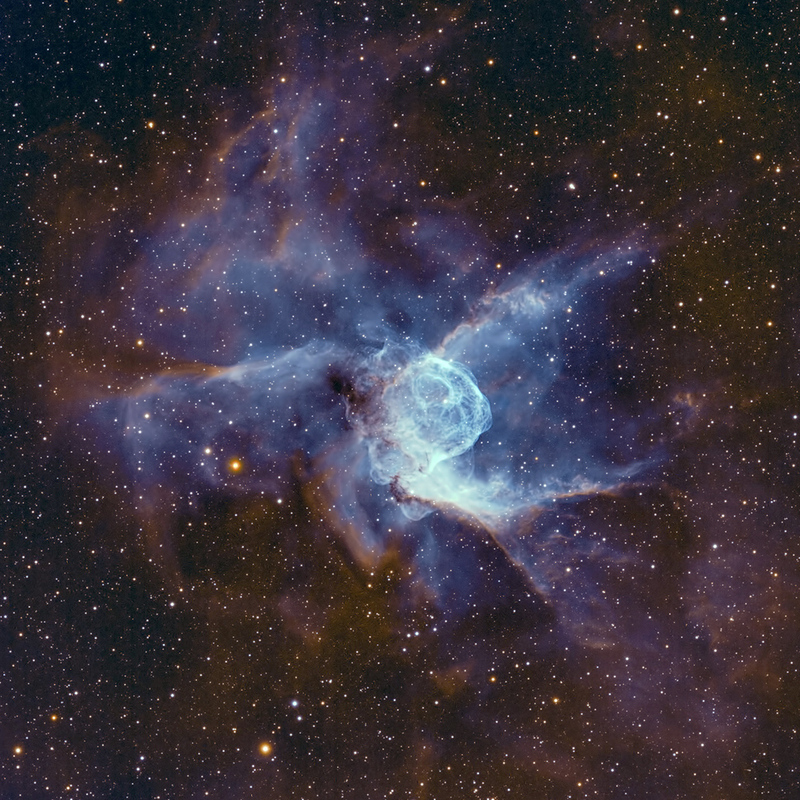 Thor’s Helmet (NGC 2359) in Canis Major is the product of a young, hot star known as a Wolf-Rayet (WR) embedded in and interacting with its surrounding cloud of interstellar gas. Lying at a distance of about 15,000 light-years from Earth, this nebula spans about 30 light-years in width. It is shown here in a bi-color narrowband rendering comprised of H-alpha and OIII data (red and blue channels respectively with a synthetic blending of the two to produce a green channel: Ha;sG;OIII). WR stars are hot, massive objects with surface temperatures of 25,000 K to 50,000 K and above, weighing in at 20 solar masses or more. They are short-lived members of the galactic community, existing for only a few million years before ending their lives in the cataclysm of a supernova or even a hypernova event. Characteristically devoid of hydrogen in their outer shell and fusing helium and heavier elements in their core to maintain their equilibrium against the inexorable crush of gravity, during their life cycle they shed mass at a furious rate by blowing off their outer atmospheres in winds reaching 2 to 5 million miles per hour, ejecting the material into the surrounding interstellar medium (IM). The energetic star in NGC 2359, cataloged as WR7, can be seen in the above image as the brightest star just right of dead center and within the bluish nebula. The effects of WR 7’s winds slamming into the surrounding IM produce the torturous, convoluted landscape we see today in Thor’s Helmet. The total exposure time for this image was 19 hours 20 minutes and was a collaboration between Howard Hedlund of Astro-Physics, Inc. and Dave Jurasevich.